Reading Mark, the evangelist’s account afresh and meditating on the agony in the garden and on the corporeality of the man there meeting his fate, we have tried to empathise and to find words for it. The German text is the original and the English a kind of rendering in thought. root of wood and earth. Precious are the blessings of ordinary men. Old time dies to hand a new its turn. Nothing from now will be what ever was. and soul alone begins its self own path. The temple curtain splits in twain. Where one falls and dies another one begins its reign. Nothing from then will be what ever was. as oil of nard still lingers on. have now no further part of you. For you to meet there is the cross. Flesh and soul in torment torn apart. Neither would nor could you hinder it. (School of) Doménikos Theotokópoulos, known as “El Greco” (1541-1614). 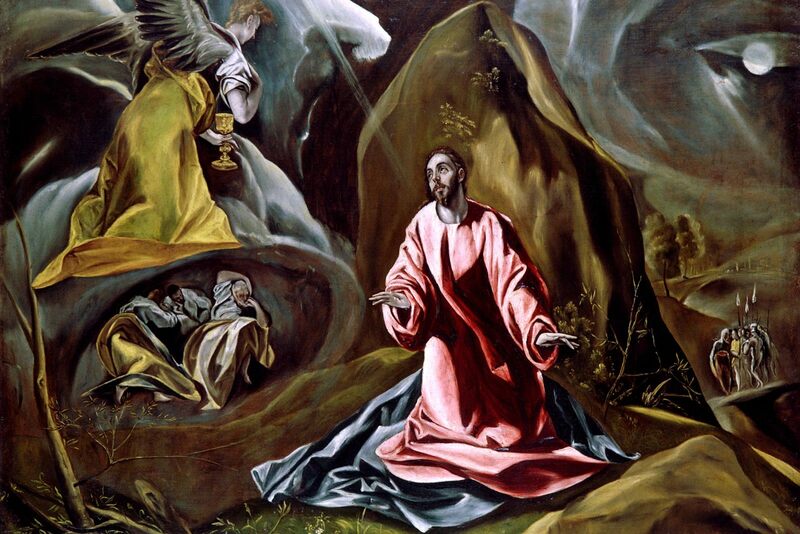 The Agony in the Garden (ca. 1605). Toledo Museum of Art. Toledo, OH, USA (courtesy of Wikiart). Nardenöl rinnt Dir ins Haar. Der Jatamanzi-Wurzel holzig irdener Duft. Ausgegossen würzig Dir auf Haupt und Haar. Segnung des gemeinen Mannes, der gemeinen Frau. Zeit kommt ans Ende ihrer selbst. Die alte stirbt der neuen Wende. Nichts wird nunmehr sein als wie es war. und Seele nimmt itzt ihren eignen Lauf. Der Tempelvorhang birst in zwein. Wo eines fällt und stirbt, ein anderes erwacht und lebt. Nardenöl rinnt Dir auf Haupt und Haar. noch einmal durch die Luftigkeit des Seins in allen Dingen. Des vielen o so hoch Versprochenen. Es aber liegt nicht mehr an Dir. In Marter trennen Leib und Seele sich. Nichts kannst Du und selbst wolltest Du verhindern. den Menschen hier ihr Los zu lindern. Enjoy the time of Easter wherever you are.